Upon your arrival at Kilimanjaro Airport, you will be greeted by our transfer driver and taken to the Meru View Lodge in Usa River on the outskirts of Arusha. The day can be spent relaxing at the lodge pool or exploring the town of Arusha (taxi required). You will have your briefing in preparation for your upcoming trek in the early evening, followed by dinner and your overnight stay. After breakfast you will be taken to the entrance gate of Kilimanjaro National Park. While your guide takes care of the registration forms, you can take the time to take in the surrounding area, read the information boards and watch the mountain crew prepare for the climb. Embarking on your trekking adventure, you will soon be immersed in the cool rainforest with lush green mosh and lichen carpeting the ground and tall trees and ferns sheltering you from the sun. In the branches you might spot the black and white colobus monkeys watching you curiously as you walk past. 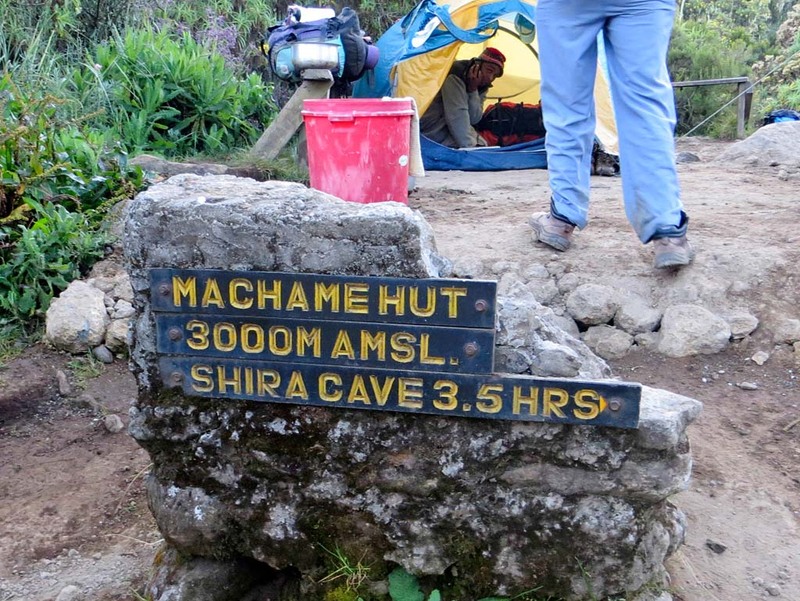 In about 5 to 6 hours, you will reach the Machame Camp, situated 3,010 m above the tree line, where you will enjoy your evening meal and overnight stay in tents. You will continue with your ascent, leaving the rainforest behind and entering the moor and heathland. On your way to New Shira Camp (3,845 m), you will enjoy spectacular views of the mountain range. 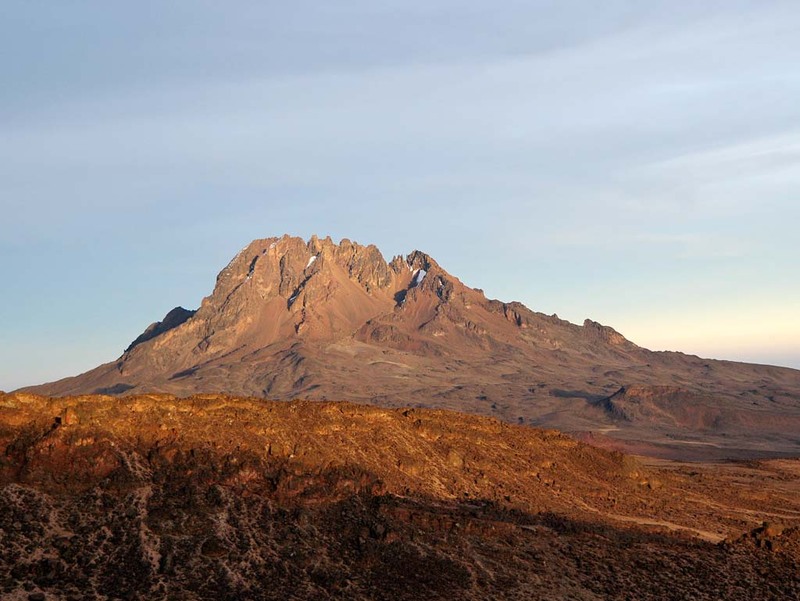 In the mid-afternoon you will finally reach your destination where you can enjoy a view of the sun glistening against the rock face and glacier of Kibo. Overnight at New Shira Camp. 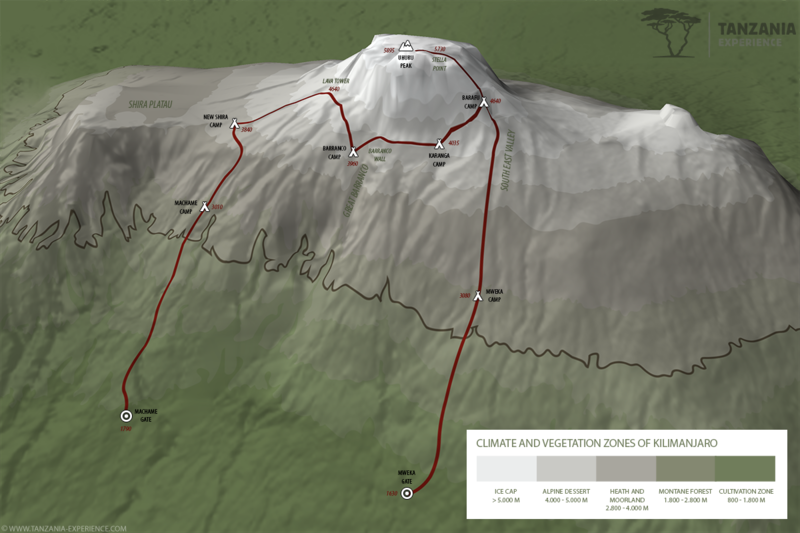 A 700 m climb is on the agenda for today, with your final destination only slightly higher than the night before. This will allow your body to become accustomed to the altitude changes, as a height of over 4,500 m will be reached over the following days. Your trek begins with an ascent above the Shira Plateau in the direction of the Lava Tower (4,640 m). The surrounding vegetation becomes more sporadic as the landscape changes to an alpine desert. The route stretches through the sweeping Barranco Valley, with its lobelia and giant senecio plants, and in approximately 6 to 7 hours, you will arrive at the Barranco Camp, the most beautiful camp on the mountain. Today you will climb the “Barranco Wall”, where a steady hold will be needed. Luckily a helping hand is never far behind and your guides will assist you wherever necessary. You will make your way across the ridge, whilst enjoying wonderful views of the Kibo’s south glacier. 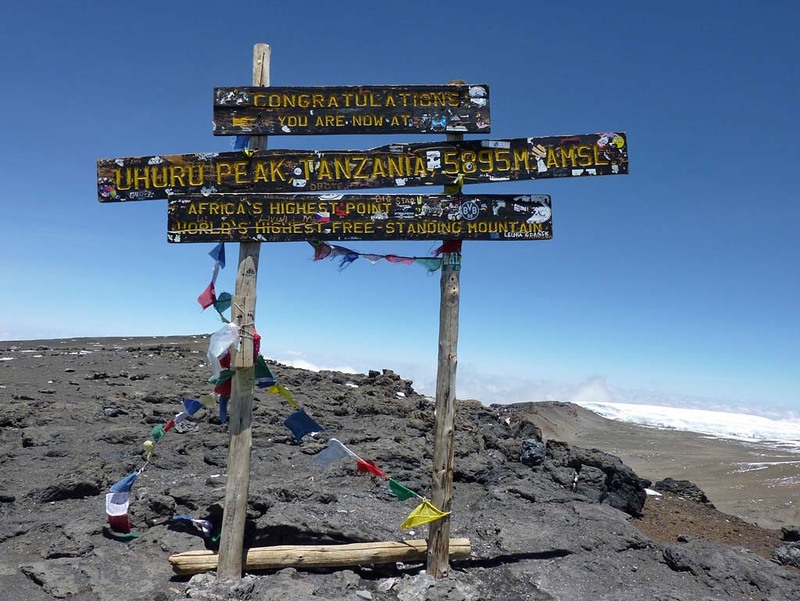 In the Karanga Valley you will stop for lunch, before embarking on another 2 to 3 hours climb to Barafu Camp (4,640 m). At the camp you will enjoy a well-deserved break, evening meal and an early night. 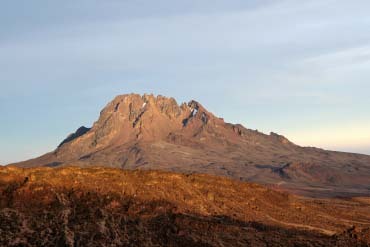 At around midnight, you will be awoken with a hot tea and light snack before you start your climb to Uhuru Peak. Ascending in the dark, with only a headlight to shine the way, you will climb the screes of Kibo, reaching Stella Point in about 5 to 7 hours. 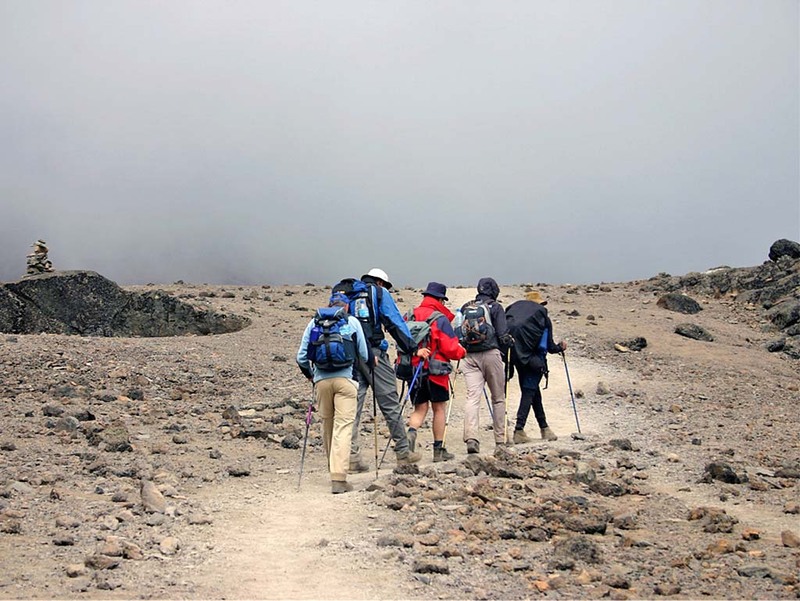 Walking along the crater ridge you will finally reach Uhuru Peak (5,895 m) high above the clouds. On the “Roof of Africa” you will enjoy a 360° view over the surrounding landscape before starting your descent along the same route. Just before midday you will arrive at Barufu Camp, where you will have a warm meal and relax before continuing another 1 to 2 hours to Mweka Camp (3,080 m). 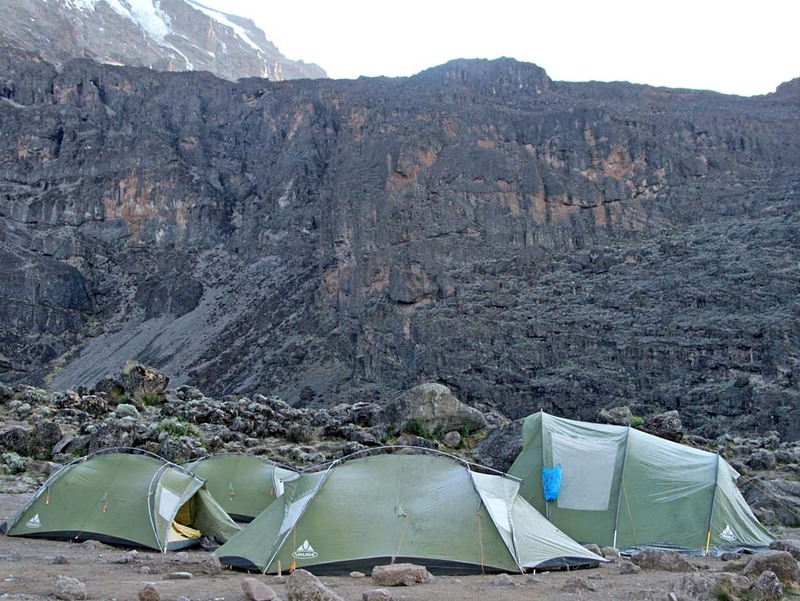 Here you will have your evening meal and sleep with the sights of Mount Kilimanjaro still fresh in your mind. The last day of your journey has arrived and after breakfast, accompanied by a traditional farewell ceremony, you will gently descend through the rainforest to Mweka Gate. Your driver will be waiting for you to take you back to the Meru View Lodge, where you can relax at the pool and celebrate your achievement. After breakfast, you will be transferred to Kilimanjaro Airport. Alternatively, you can extend your in Tanzania and go on a safari or relax at the Indian Ocean.